In order to list your products to multiple Amazon sites / markets, you will need to setup one account in WP-Lister for each site you want to connect to, no matter whether you will be using the same Amazon account or a different one for each account in WP-Lister. 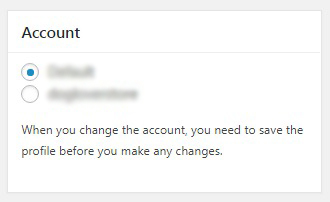 You can visit WP-Lister > Settings > Account, add a new account and connect it to the appropriate marketplace. If you wish to list WooCommerce products to three marketplaces - Amazon US, CA and UK for example - you would need three accounts set up in WP-Lister, one for each marketplace, even if you'll be using the same Amazon account for all three accounts. Each account connects to the marketplace you connected the account to when creating the accounts in WP-Lister. You can use this account selection to connect the profile with a specific site. When you list products with that listing profile, it will list to the account you have selected in the listing profile. This means you will need at least one listing profile for each account. You can list the WooCommerce product to marketplace A with listing profile A (which should have the account selected in the “Accounts” section to list to the first marketplace). After that, you would go through the same process of selecting the listing on the products page of WooCommerce, select “List on Amazon" option in the bulk action drop down menu and click Apply. Then select the listing profile in the popup window that is connected to the account/marketplace you want to list to.